Khalid Jamil's men outplayed Luis Norton De Matos' boys to ease to a 2-0 victory. All India Football Federation’s developmental side Indian Arrows lost 0-2 to table toppers of the Hero I-League Kingfisher East Bengal at the Ambedkar Stadium in the capital today (January 02, 2018). The table toppers started their new year on a positive note, making easy work of Indian Arrows who provided little resistance to the Kingfisher East Bengal juggernaut as goals by Mahmoud Al-Amna and Katsumi Yusa in the 13th and 16th minute respectively led Khalid Jamil’s men to an easy win. The glimpses of an attacking display by the visiting team were evident in the very first minute of the match when Syrian International Mahmoud Al-Amna almost capitalized on a through ball from the middle of the field. Three minutes later, Katsumi Yusa sublimely waiting patiently inside the box curled the ball home to double Kingfisher East Bengal’s lead to make the scoreline read 2-0. The Indian Arrows stunned by two back-to-back goals tried to hold fort by keeping possession in the middle of the field. Attacks however by the Indian Arrows were easily thwarted by the table toppers. In the 36th minute, Kingfisher East Bengal came close to tripling their lead when Jobby Justin’s shot hit the side-netting after a failed clearance by Anwar Ali. The Arrows tried to minimize their deficit but were held at bay as Kingfisher East Bengal led by two goals to nil at half-time. 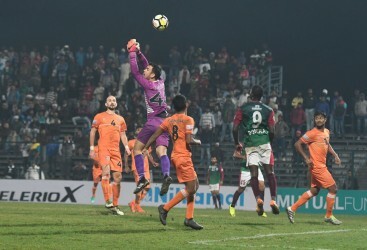 Changing over, the Indian Arrows appeared a much more compact side in the second half and Coach Matos introduced Suresh Singh in the centre of the field in place of Abhishek Halder. The Arrows kept possession and threatened the table toppers in the 57th minute when Sanjeev Stalin’s corner kick was headed by Anwar Ali, only for Abhijit Sarkar to try a back-heel kick and force the Kingfisher East Bengal custodian to make a save. 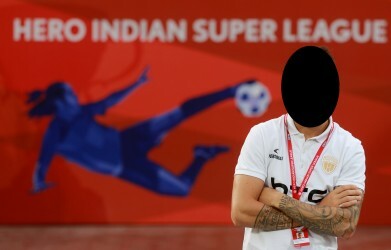 However, the attacking danger of the visiting team was still looming, in the 62nd minute, Ralte’s header off a Yusa’s cross earned a top class save by Prabhsukhan Singh Gill. The visitors out-muscled the Indian Arrows when needed for possession and cleared any dangerous Arrows’ attacks. Sanjeev Stalin’s freekick in the 64th minute when inches over the bar as the Arrows looked for a goal to minimize their deficit. However, in the 74th minute, Katsumi Yusa’s effort from a tight angle was kept out by Gill as Kingfisher East Bengal looked to extend their lead and put the fixture to bed. Al-Amna could have put the tie to bed in the 82nd minute but his effort from a Katsumi Yusa freekick went just over the Arrows goal. The Indian Arrows tried to minimize their deficit but failed to pierce the Kingfisher East Bengal defence, slumping to their fourth defeat of the Hero I-League as the full-time scoreline read 2-0 in favour of the visitors.